The Egypt portion of adventure came to a close with two and half days spent in the country's biggest city, Cairo - home to nearly 20 million people. Thus far in our travels not one person had even one good thing to say about the place, so expectations were low. Things at least started off right on arrival - though more humid, it was mercifully a bit cooler than our other stops on the trip. As expected, it was insanely busy on the sidewalk, in the streets, and everywhere in between. Anybody familiar with the Frogger video game can appreciate what it means to cross a street in Cairo. As our first day was spent walking all over downtown, we got practice and learned the best way to cross is to find a "Cairene" (a local) who is looking to cross, and basically be their body double. A couple times we found ourselves literally on the lane marker in a three lane road (not that the lines mean anything of course). We visited the Egyptian Museum, which more or less resembles a warehouse - sarcophigi, statues, and other artifacts & antiquities pretty much all over the place, with little signage and very little/nothing in the way of protection. We enjoyed seeing artifacts from the city of Amarna, which played a prominent role in Nefertiti, one of the books on our reading list. For an additional fee we were also able to see the Royal Mummies, the heads/hands/feet of which are unwrapped - Juli was not so into it, but I enjoyed it - there is one who quite obviously died in battle - his twisted hands, look of pain on his face, and the giant dent in his skull remain. The golden mask of King Tutankamun was spectactular and probably worth the price of admission alone. Day two was an early start to visit the Pyramids at Giza. After a slight mix-up with a taxi (who claimed he thought we wanted to go to the 'Pyramisa' hotel downtown, and then required help with directions to the actual pyramids), we arrived at the Giza plateau and reveled in the sight of these massive tombs. Although we did not arrive in time to buy a ticket to enter the pyramids (only 300 tix per day), we got even by climbing to the top of a small one, which I know is a big no-no, but hey we were invited to do so by the 'security guard' who cheerfully requested a $20 bill for his discretion. 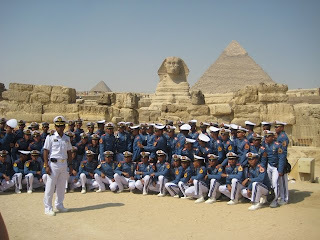 We completed our tour by visiting the way-overcrowded and much smaller than expected Sphinx, along with the Indonesian Navy & Marines. On the way back to the hotel, we stopped for lunch at a fantastic felafel stand. My co-workers in NYC give me a hard time because I am a big fan of this hipster/stuff-white-people-like felafel place, and I am constantly defending it against their claims that it's not all that. All trip I've been looking for an authentic one that I can definitely say I like better - and I finally found it. Perfect, fluffy chickpea balls and a great cucumber salad within. Not to mention the price can't be beat - $0.25 per sandwich! After a cool-down & nap at the hotel pool, we headed for the Khan Al-Khalili marketplace - a winding, massive maze of shops and souvenir stands. After our experience cruising the Nile, we were prepared for quite an onslaught of sales pitches - but overall it was fairly tame, certainly nothing more pushy or crafty than we had been subject to before ("Welcome to Alaska," "Free to look", and "I can help you spend all your money" are favorites). To wrap up our time in Cairo, we decided to go to a nicer restaurant for dinner. This decision seems to be our achilles heel - almost every time we have sampled a 'nice restaurant' (note for Egypt this would be one with napkins), we are ultimately dissapointed in the experience. This time was no different unfortunately - the place had spectacular views of the Nile and a very 'South Beach' ambiance, but the food and service were totally lousy. The place drained our wallets to our last 100 Egyptian Pounds (about $25 USD) which we figured would be just enough to pay for some laundry, get us to the airport. and maybe buy another felafel sandwich. You paid a security guard $20 to climb a small pyramid? Good work, guys!